Upon arrival at Maun Airport you will clear customs and collect your luggage. Our representative will meet you in the Arrivals Hall and will accompany you to the light aircraft for your 30 minute flight into Khwai airstrip, across the Okavango Delta. 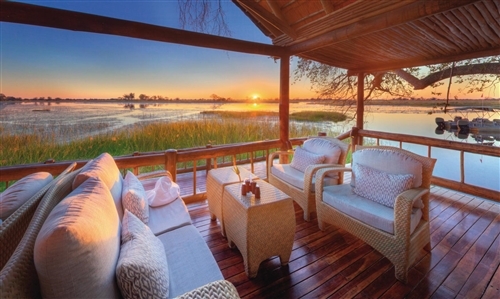 Nestled on the edge of a leadwood and fig tree forest, overlooking the vast Khwai River floodplain and beyond into the Moremi Wildlife Reserve, sits the luxurious Khwai River Lodge. 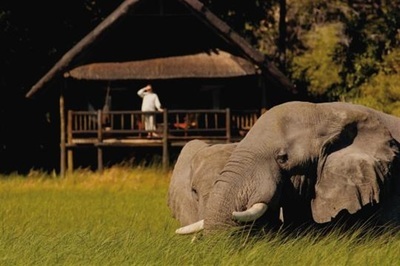 Khwai River Lodge lies just outside the Moremi Reserve, with game drive access into this wildlife haven. Khwai River Lodge accommodates its guests in luxury tents situated on raised wooden platforms with traditional African thatch roof. Private decks with easy chairs and hammocks provide panoramic views. Inside you’ll find a netted four-poster bed, an elegant bathroom, a stocked mini bar and discreet air conditioning. Khwai is renowned for its large concentrations of mammals and it is not unusual to see many different types of wildlife from the comfort of your own private deck. As a year round destination for wildlife, predators can regularly be seen in the area, rated as one of the most prolific in Botswana for viewing wildlife. 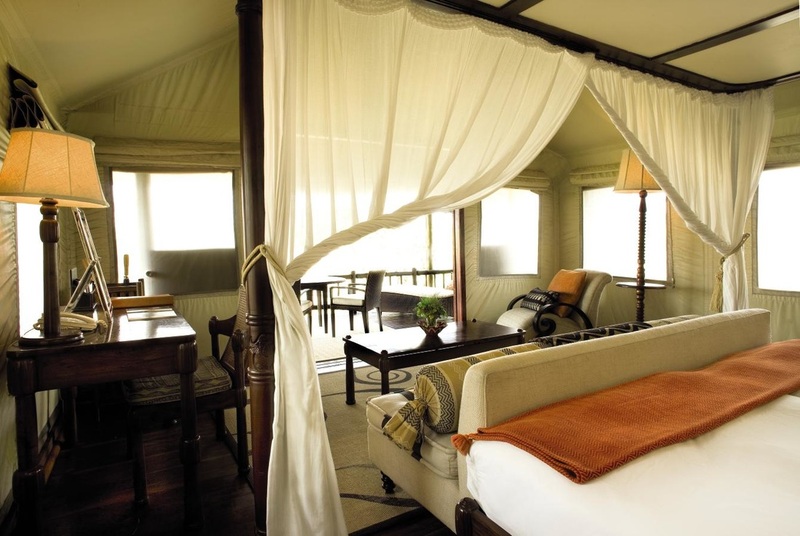 The exceptional location of Khwai makes its a regular host to Elephant, Buffalo, Lion, Leopard, Cheetah and Wild Dogs. Birdlife can also be viewed in abundance with exceptional sightings of wildfowl and raptors near the lodge. This is the perfect location for observing the perennial drama of the African bushveld and provides excellent birding. 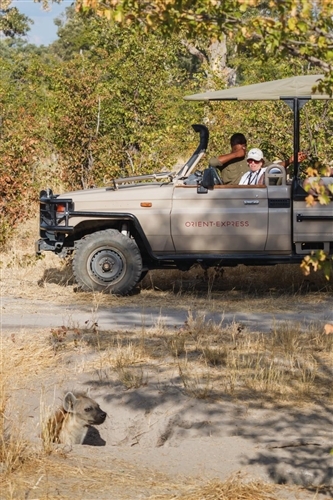 After an early morning activity, breakfast and brunch, you will be chartered from Khwai airstrip to Eagle Island, 30 minutes away, across the Okavango Delta. Eagle Island Lodge offers accommodation in luxury tents, housed on raised wooden platforms and shaded by a traditional African thatch roof. Private decks with easy chairs and hammocks allow you peaceful Delta views. The rooms have an en-suite bathroom, a four-poster bed with mosquito netting, a fully-stocked mini bar and discreet air conditioning. Lodge facilities include Al fresco dining overlooking the lagoon, a 20m swimming pool, a high powered telescope, internet access and satellite TV, the romantic Fish Eagle Bar, a Curio Shop and a small reference library. During your stay, all meals (breakfast, lunch, afternoon tea and dinner) along with all drinks (teas, coffees, soft drinks, house wines, local beer and spirits including premium brands), twice daily game viewing activities, laundry and park entry fees are included. 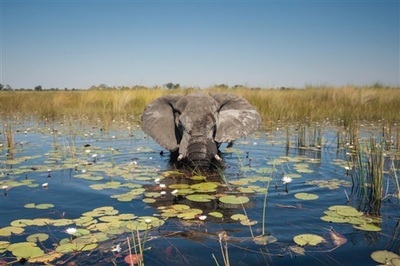 Even though the Okavango Delta is technically known as a swamp, the water is remarkably clear, and free of impurities. It is also heavily stocked with fish. So it will come as no surprise that this area boasts the highest concentration of magnificent fish eagles on earth. The plethora of food attracts every variety of bird with a hearty appetite for fish, including herons, cormorants, pelicans, darters and storks. Eagle Island Lodge offers game viewing activities in the morning and late afternoons. 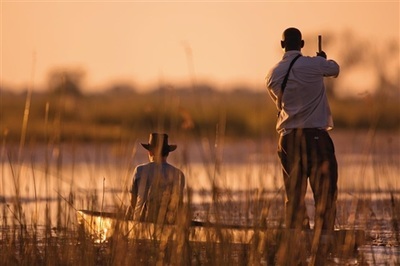 Bird and game viewing is done either from motorised boats or mokoro (traditional dugout canoes), which are poled along effortlessly and quietly through the clear waters of the Okavango. The area offers exceptionally high quality wildlife viewing with prolific birdlife and mammal sightings. Activities at Eagle Island include mokoro (traditional dugout canoe) excursions, boating, and professionally guided walks. A scenic helicopter flight over the Delta may be booked at an additional charge. Today you will be chartered back to Maun Airport (20 minutes), in time for your onward arrangements. • All meals (breakfast, lunch, tea and dinner), all drinks including premium branded spirits and wines but excluding VSOP spirits, reserve wines & imported champagne, daily laundry services. • At least 2 game viewing activities daily, emergency medical evacuation insurance and national park fees, VAT in Botswana.